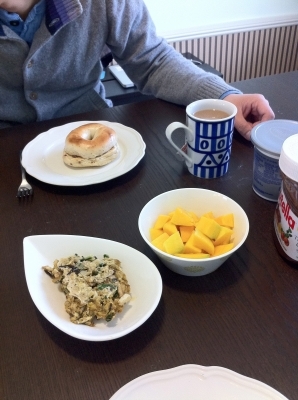 Totally unplanned but perfectly colour coordinated meal for St. Patrick's Day! 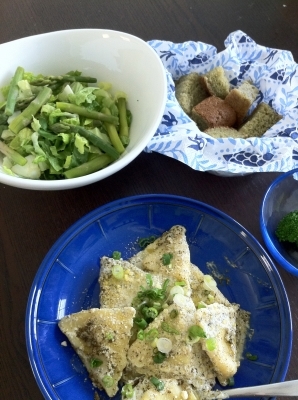 The ravioli is store bought. But even these ready made products were hard to buy at first, so getting to know where and what to look for has really made my life easier. Salad is something that we have been eating as a "meal" more since we moved here. There is such a good variety of fresh food and products I can use to volumise a salad into something more hearty like olives, artichoke, beats and also asparagus, red onion and baby leaves. Thankfully Kanata loves salad, too, so it's not uncommon to see the whole family munching through greens like horses! "meat and potatoes" probably the most classic meal you can get here. 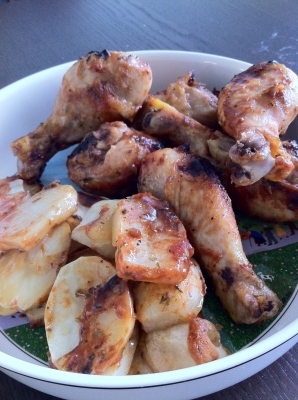 Meat usually refers to beef but we are not a big beef eater so I made this dish with chicken drumsticks and russet potatoes - marinade chicken in a mixture of soy sauce and BBQ sauce, and bake in the oven over a layer of sliced potatoes. I absolutely love having an oven. In Japan I was often frustrated that I only had a small microwave/oven but now I feel much free in the kitchen! 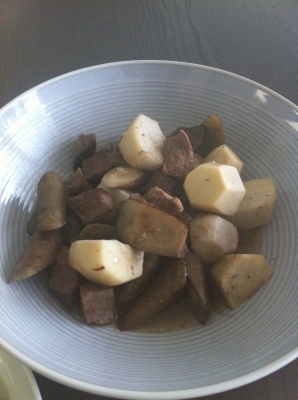 A Japanese version of "meat and potatoes": slow cooked beef, yam, and burdock. This is not a menu or recipe... But we have been enjoying more fruit since we moved to Michigan. Fruit, particularly non-staple varieties, can definitely be on the expensive side in Japan, so I was often forced to cut back on the amount of purchase. But now it is a completely different story. There are so many nice choices other than just apples and bananas like grapes, plums, and mangoes. It seems that even the organic fruits are cheaper than what you get in Japan. I mean, to be honest, I was shocked to see mountains of glass-shiny apples in the vegetable section of the grocery store for the first time. It was equally shocking to see bottles of "fruit and veg cleaning detergent" neatly lined up on a shelf in the fruit & veg section, too.